A set of flashcards are put in a line along the floor. One student from each team stands either side of the first FC of the line. The game must begin with the two #1 students playing first. Saying each flashcard in turn, the two #1 students progress to the end of the line. I.e. they slowly say the FCs together (each time saying aloud the FC they are standing next to) as they move to the final FC nearest the whiteboard. Once they reach the final FC they do a paper scissors stone. The winning student can sit down while the losing #1s must go back and play again against the other team’s #2s. Again a paper scissors stone once they reach the end of the line and the winner returns to their seat while the loser has to go back and do it again, competing against the next student from the opposing team. The first team to have all its members play and win is the winner. The game can then be played again with the #6s playing first. This is a good review game, and a great way to get the students to say all of the target FCs individually. They have a little help from the student they are competing with (often the two students will say the FCs in unison). 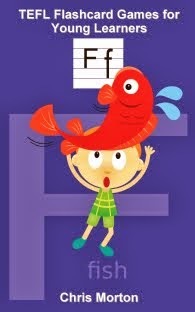 If a student mispronounces one of the FCs you can make them say it again, helping them with pronunciation.